LOCATION. LOCATION. LOCATION. 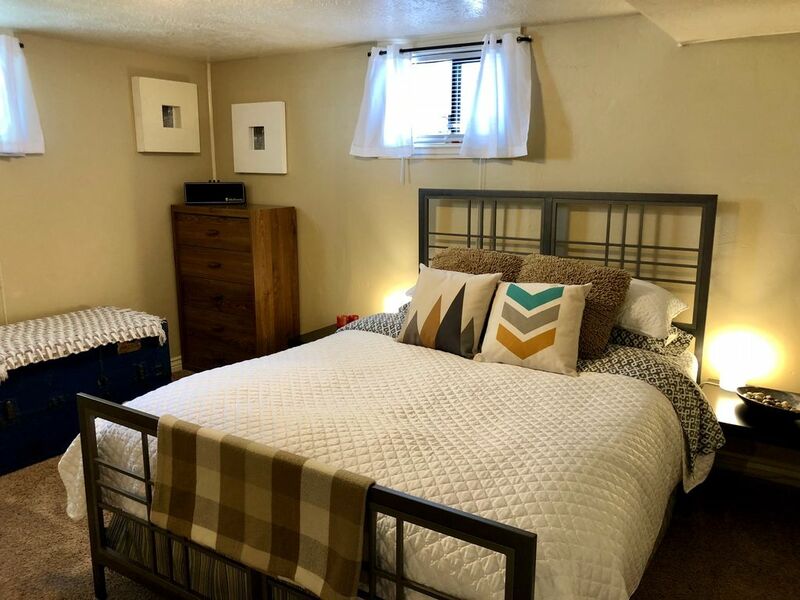 Cute, cozy bungalow in central quiet neighborhood near downtown Salt Lake City, freeway access and very near the airport, basement mother-in-law, 2 bedroom, 1 bath and laundry and wonderful fenced backyard space with fire pit and covered picnic patio. Easy access to the city, freeways and airport. Guests will have access to the basement apartment, on street parking that has unlimited time, and a fully fenced backyard common space that includes a covered patio with a table and chairs, lawn, garden, fire pit and BBQ. We don t live on the property, so you most likely won t see us unless we are doing yardwork on the weekends. There is also a separate basement apartment that may have guests during your stay. There is a neighborhood grocery store only blocks from our home. The Jordan River Parkway is also only blocks away and is great for biking and running. Very close to the State Capitol, City Creek Park, The Mormon Temple and there are several neighborhood parks nearby. We love that our neighborhood is diverse in culture and ethnicity. Our place is located only 5 blocks (.8 mile) walking distance from the Jackson/Euclid TRAX (SLC lightrail) train station that can take you to and from around downtown and to the airport. An Uber to downtown is about $5-6, to the airport around $10 depending on demand. We are also located right near the 600 north Interstate 15 and Interstate 80 freeway entrance and exits if you will have your own vehicle. The Salt Palace Convention Center is about 2 miles away. My husband and I live in Salt Lake City, Utah. We have two kids, Caeldton who is 21 and now in the Navy. Rieley who is 19 and off to college very soon. We also have a dog named Zephyr, Z for short, who is a retired greyhound racer and thinks he's a people. We enjoy traveling, but mostly enjoying our beautiful state in the outdoors like camping, hiking, skiing, biking and backpacking. Last year we bought a vintage 1978 Airstream Argosy, so most weekends in the summer we aren't home. We value relationships and have a great network of friends and family, and we enjoy meeting new people. We are seasoned hosts and know how to make your stay enjoyable and easy. Our property gets high marks always for cleanliness, amenities and it's central location to downtown, the freeways and the airport. Our place is a cozy little bungalow that is well taken care of of clean. We pride ourselves on making our space a place our tenants can enjoy inside and outside. Very near downtown SLC, only 3 miles. 2.1 miles from the Salt Palace Convention Center downtown. Streaming with huge TV and surround sound system. We had every appliance we needed. The bed is comfortable and everything is very clean. It was very nice having access to Netflix and other streaming services and movies! Amazing place to be and close to food and entertainment! Thank you!! Great location and clean. Perfect for 2 people. Quaint cozy property with everything you need. Close and convenient to lots of sights and amenities. A perfect space to kick back and relax in after long days of exploring the area. Great location - very close to downtown and the freeway! Apartment was clean and we had everything we needed. The beds were very comfortable and it was nice to relax on the couch and watch Netflix after exploring all day. It was a little chilly but so thankful for the space heaters and extra blankets. Jason was very responsive to questions and offered yummy restaurant recommendations! The house was clean and well stocked. Beds were comfortable! Would definitely stay again. Only problem was no plunger for the toilet. However, a call to Kevin and it was delivered promptly and the problem resolved! Loved the chalk wall as well. Thanks for the stay! The location of the house is perfect! Minutes to downtown, just off of the highway easy access to everything! I had to make numerous trips a day to and from the downtown area and in between the trips I was able to relax inside the cute house. It was nice and cool, where outside was incredibly hot! At first it seemed small but after we got settled it was a perfect fit for us. Everything you ever thought you would need was located inside here and available for you to use. They really thought of every detail! The only thing I didn't realize prior and wasn't an issue for us was the ceiling is low, so if you are over 6 ft you might be a bit cramped. Would definitely stay here again and recommend it to all! Thank you for the great review! Loved hosting you. Only 2.1 miles from the Salt Palace Convention Center and Temple Square.